Urban Sanctuary has over a dozen massage therapists on staff who specialize in pain relief and deep tissue massage. The health benefits of massage are too many to name all in one place. Massage therapy is greatly underestimated in its capacity to reduce pain and enhance well being. When used in conjunction with other good practices, massage therapy acts as very effective preventative medicine for both women and men… Here’s a list of the benefits that our clients mention most often. The healing properties of touch are immeasurable. They can be felt by both the giver and the receiver. Specific techniques can be employed by our massage therapists to achieve very specific results. General relaxation techniques can be employed to help your body let go of stress and tension. Both specific and non-specific massage techniques work to recharge all of the body’s systems… This has a great impact on a person’s overall energy level and sense of well-being. Massages scheduled at regular intervals tend to yield more noticeable long-term results. Putting an hour aside every 2-4 weeks to provide something nourishing for your body is one of the best gifts you could give yourself. Urban Sanctuary has very attractive massage series rates available to make having massage at regular intervals much more affordable. With a spa series you’ll save $45-$145 for every 6 services you purchase. Inquire by calling us at 706-613-3947. 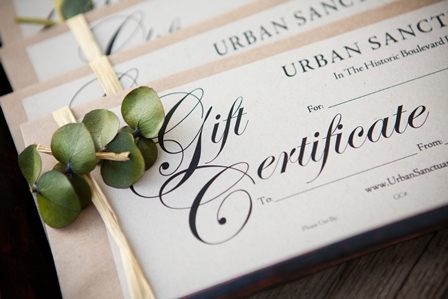 Gift certificates for massage, facials, waxing and all Urban Sanctuary services can be purchased online.